Featuring some items that I got from one of my favorite online seller WishMnl. All of her items are original and are imported. Some are onhand and some are for pre-order. For this week's spread in my Starbucks Coffee Stain planner, I used the French Girly Amifa washi tape on top and bottom of both pages. Following the vertical prints of the Chamil Garden 3rd Florist washi tape, I used it to the sides and center of my week spread. Combining them both on my month spread for January. Yaaay! For another set of washi tapes from wishmnl.com! ^_^ 1 roll of Aimez Le Style washi tape, 1 roll of Amifa French Girly washi tape, 1 roll of Amifa Summer washi tape, and 3 samples of Chamil Garden washi tapes. Used Boulangerie washi tape by Aimez le Style for the top and bottom of this week's spread. And because we are havin' an early summer vacation to Boracay, I used this pretty Amifa summer washi tape both for top and bottom of this week's spread. Aside from washi tapes, wishmnl.com also offers Tim Holtz cling stamps. And these two, the Schoolhouse and Travel cling stamps are some of my favorites. Love how Tim Holtz cling stamps matches my Chamil Garden washi tapes. And yes! Classiky washi tapes are also available at wishmnl.com! I just love this old book set. 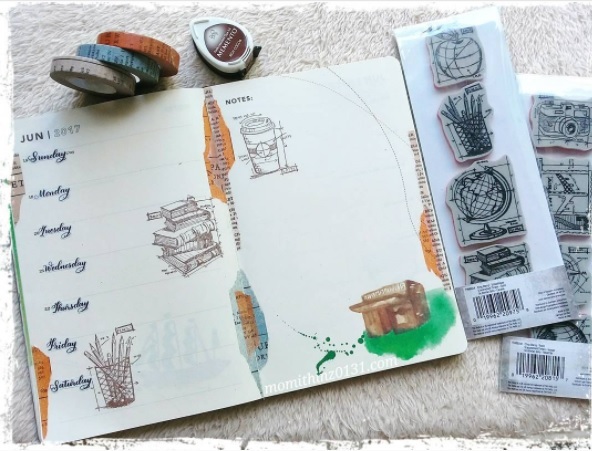 Now using my Old Book Classiky washi tapes with my Tim Holtz cling stamps still in my Starbucks Coffee Stain planner. She's present in most of the planner meets, specially on Hobinichi and TN group meets to sell pretty washitapes, stamps and stickers. You can check her products online through her online shop and social media accounts.